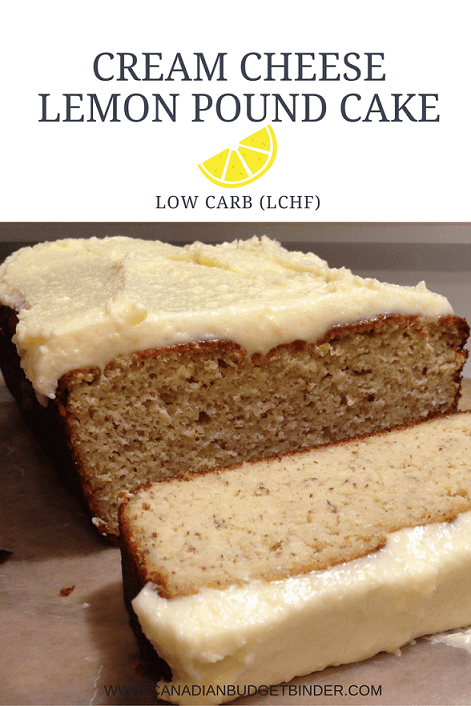 If you’re looking for a low carb, sugar-free, grain-free, gluten-free cream cheese lemon pound cake then you’ve clicked on the right link because even I can’t tell it is low carb and polished off a few slices. Creating low carb dessert recipes for my wife to enjoy can be challenging but once you understand how the ingredients work together easy low carb desserts can be brought to life. Creating recipes is about experimenting which can be fun even if your recipe doesn’t turn out as planned. I’m no pastry chef and working with flour that contain no gluten, eggs, butter, coconut oil and cream cheese to re-invent the pound cake took some trial and error. With my wife’s birthday this month I wanted to create a low carb pound cake since it’s her favourite type of cake. She loves how a traditional pound cake is dense and perfect for dipping in coffee or milk. It has been almost one year since she’s given up sugar, grains and most fruits and vegetables to lead a low carb lifestyle. She loves this way of eating, feels great and has lost all the weight she gained when she was pregnant with our son. She credits the low carb diet plan, moderate exercise and portion control for her success although she is not done on her journey. This has become a lifestyle for her and she has no intentions of going back to eating the way she used to because she was always feeling bloated and hungry. She even said her skin feels and looks so much better especially since she drinks a tonne of water every day. Her cholesterol is fine and the doctor is impressed with how well she has done considering it’s not easy for people to give up carbs, sugars and processed foods. Low carb foods still have minimal carbs in them but not near as much as you’d think compared to other foods that are loaded full of carbs. The low carb diet plan is not for everyone and you should consult your doctor before embarking on this life-long journey (that’s what Mrs. CBB calls it). If you even say it’s a diet she will tell you it’s a way of eating, a life-style change since not everyone digests carbs the same way. Many low carb recipes have low carb flour such as almond flour and coconut flour. These are the two flours that Mrs. CBB uses the most. Almond flour adds moistness to the cake and a nutty flavour. The almond flour can be pricey at around $11/pound and coconut flour $5/pound at the Bulk Barn. We try to buy it when it’s on sale along with the spend $10 save $3 coupon to keep our budget in check. She doesn’t use lots of it as she only wants her low carb snacks once a month to get her through her sweet and salty times, if you know what I mean. Other than that she doesn’t care for sweets any other time unlike myself who could eat chocolate just about every day. I’ve tested this recipe 3 times using various methods including an increase and decrease in eggs, almond flour and other ingredients until we came up with the perfect cream cheese lemon pound cake. When I tried the finished product I could have easily been convinced that it was a madeira cake which is popular in the UK. I would have had no idea it was a sugar-free low carb lemon pound cake if I wasn’t the baker. You can eat this cream cheese lemon pound cake as-is OR you can make a sugar-free cream cheese buttercream icing for the top and sprinkle with unsweetened coconut flakes. You can leave the coconut off if you don’t fancy it so it’s entirely up to you. The easy cream cheese icing can be made right at the end or you can make it in advance and store it in the refrigerator the day before or hours before frosting the cream cheese lemon pound cake. Just let it sit out for a about 10 minutes to soften up before icing your cake. 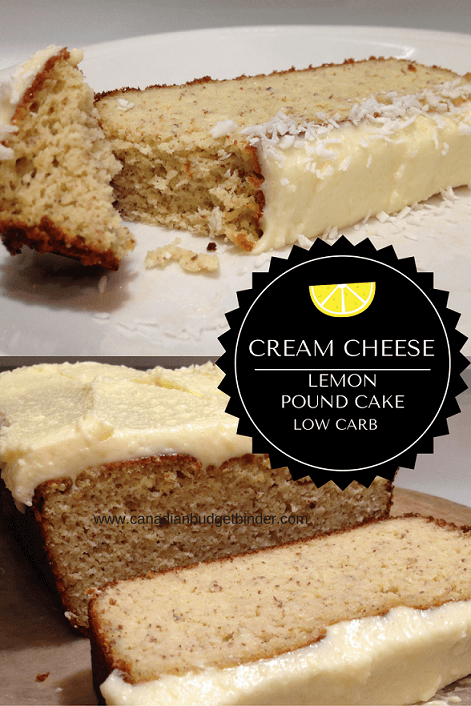 Let’s get baking this low carb cream cheese lemon pound cake!! The cream cheese lemon pound cake is best when it’s a day or two old and left in the refrigerator to chill. The reason we believe is that it gives the cream cheese lemon pound cake time to soak up all the flavours which creates a cake that could stand up to any other pound cake. The best part is that there isn’t a pound of butter in this cream cheese lemon pound cake. You’ll be surprised when you read the ingredient list. 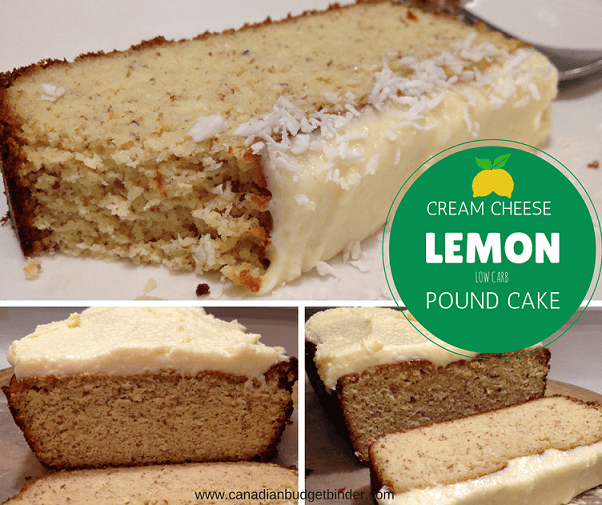 If you're looking for a low carb cake to satisfy your sweet craving this cheese cake lemon pound cake is packed full of flavour and is dense like a pound cake should be. In a large bowl add your butter, coconut oil and cream cheese. Mix until combined and creamy. Add your 5 large eggs, almond milk, vanilla extract, lemon extract, lemon juice and lemon oil and mix. Add the dry ingredients to the wet Almond flour, salt, baking powder, baking soda and Erythritol and mix. Bake for approx 40 mins at 350 degrees. If you notice the top is browning early on simply put a piece of tin foil over top to prevent burning. When a toothpick comes out clean the cake is done. Every oven is different. For the buttercream cream cheese icing put all of the ingredients in a bowl and whip it up with a hand mixer until creamy and fluffy. Spread on the cooled cake. Make sure it is completely cool so it doesn't melt off. Top with unsweetened coconut which is optional. You can even just enjoy the cake without the icing. Refrigerate the cake until cold, slice and serve. Best 2 days after you make the cake. You can add or delete sweetener as desired. Like I mentioned above this cream cheese lemon pound cake seems to be at it’s peak 1-2 days after it’s made and refrigerated. You can freeze the cake as well for up to 3 months. If you don’t care for lemon you can add a different flavour or leave out the lemon and add a bit more vanilla extract to make a vanilla pound cake. What are the nutritional facts (macros)? Please see the end of the post. Where at the end of the post? I don’t see any nutritional info. That was my fault sorry as I thought I was at the end of the post when I stopped scrolling. This is the nutritional info I have. This is an older recipe compared to the nutrition I add today. OMG! This looks so delicious! I love lemon and cheese! It’s so good Jamie…. I’ve made one for my wife’s birthday so she can have a cake to enjoy!!! Allergic to tree nuts can I use another flour? I haven’t tested it with any other flour. What flours are you able to have? I need a regular Gluten Free white flour~ I have not tried making with reg flour afraid to screw it up. Don’t be afraid I don’t think you will have much problem with the flour change. Here is a great link that might help. From what I’ve read tonight it will likely be trial and error. Give it a shot and see what happens.